I find it also matches with a lot more clothes than gold does and I love the 'boho' vibe it gives off. The one thing I find hard though is finding a bag with a silver clasp (am I just looking in the wrong places?) but I cannot stand to have a perfect matching array of intricate silver jewellery to then have to use a bag with a GOLD clasp... Ergh. 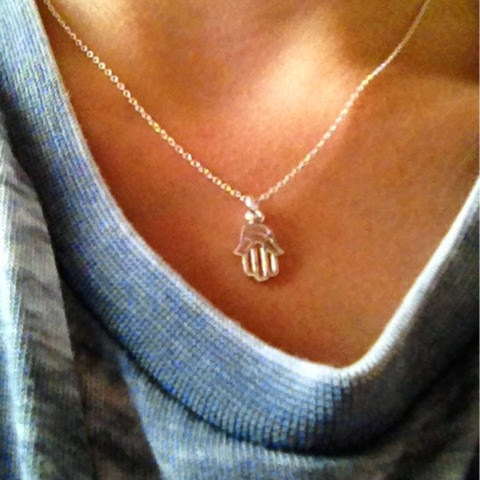 So, when I spotted this dainty little sterling silver hamsa hand pendant online I had to not just get one, but two as I knew my sister would be in love with it too! They arrived in two individual gorgeous little square boxes which opened up and contained the most perfect text, of course the necklace and also a little card! I purchased the necklaces from Claire's Accessories online in the sale and it was a fantasitc offer, three items for £5! The brand of the necklace is One Wish and after searching around I found as well as Claire's, Simplybe.co.uk also stock a huge range of their products (if only I was rich eh?)! It doesn't have an extender chain but that isn't a problem for me as I love wearing 18 inch necklaces and feel at that length the little pendant hangs perfectly. The card just tells you a little about the company and their products which I thought was a nice touch! I gave the other one to my sister for her 15th birthday and it's safe to say she loved it, she posted a pic of it in Instagram right away and hasn't taken it off since (who else is jel of her tan?)! Overall I would certainly recommend One Wish, especially if you love quirky silver jewellery. They have an extensive choice of necklaces, bracelets and rings to suit all tastes and styles. I feel the items are so simplistic but give such a wow factor to an outfit. They say less is more and in this case that is most certainly true!